The original name of St. Patrick was Succat, which is said to signify "strong in war." Patricius appears to have been his Roman name. He was born of Christian parents at some period between A.D. 372 and A.D. 415. His father, Calphurnius, was a deacon, his grandfather, Potitus, a priest Though an ecclesiastic, Calphurnius would seem to have held the rank of decurion, and may therefore have been of Roman or provincial British extraction. His birthplace was a spot which he himself calls Bonavem Taberniae, and which in all probability may be identified with the modern Kirkpatrick, between Dumbarton and Glasgow. The parents of Succat, as has been already said, were Christians, and it would seem that the Gospel had been preached to some extent in the neighborhood of his father's home. Whatever amount, however, of instruction he may have received was rudely interrupted, when he was about sixteen years of age. The coasts of Scotland were at this time exposed to the frequent incursions of Irish chieftains, who landed from their swift barks, ravaged the country, and having carried off as many of the inhabitants as they could, consigned them to slavery. In one of these expeditions the house of Calphurnius was attacked, and Succat, with two of his sisters and many of his countrymen, was carried away and conveyed to the north of Ireland. Here he was purchased as a slave by Michul or Milchu, a chief of North Dalaradia, who dwelt in the valley of the Braid, near Mount Slemish, in the country of Antrim. The work assigned him was that of attending his master's flocks and herds, and in his "Confession," which he wrote toward the close of his life, he describes how he wandered over the bleak mountains, often drenched with the rains, and numbed with the frosts. His period of servitude lasted six years; and during this time he would seem to have made himself acquainted with the language of the native tribes, and to have learned their habits and modes of life. At length he succeeded in effecting his escape to the seaside, where he took ship, and, after a tempestuous passage, regained his father's house. His stay, however, was destined to be very short. In a predatory excursion he was a second time taken captive, and again, after a brief interval, succeeded in making his escape. Had he listened to his parents, he would now have remained with them, but he was bent on a very different occupation. "The Divine Voice," he says, "frequently admonished me to consider whence I derived the wisdom which was in me, who once knew neither the number of my days nor was acquainted with God; and whence I obtained afterward so great and salutary a gift as to know and to love God." During the weary hours, moreover, of his captivity, he had often reflected how blessed a thing it would be if he, to whom it had been given to know the true God and his Son Jesus Christ, could carry the glad tidings to his master's people and the land of his exile. One night, he tells us, he had a dream, in which he thought he saw a man coming from Ireland with a number of letters. One of these he gave him to read, and in the beginning occurred the words, "The voice of the Irish." While he was reading it, he thought he heard a voice calling to him across the Western Sea, "We entreat thee, holy youth, to come and walk among us." Obedient, therefore, to what he deemed to be a plain leading from heaven, and resisting the arguments and entreaties of relatives and friends, who mocked at his enthusiastic resolve, he set out for the monasteries in Southern France, there to prepare himself for the work of preaching the gospel in the land of his captivity. Amidst the conflicting legends which now follow him at every step, it seems probable that he repaired to the monastic schools of Tours, Auxerre, and Lerins, where he studied and was employed for some little time in pastoral duties, having been ordained successively deacon and priest. There, too, he would seem to have been elevated to the episcopate, and thence with a band of fellow-laborers he set sail for Ireland, about the middle of the fifth century. Landing on one of the islands off the coast of Dublin, he and his companions tried unsuccessfully to obtain provisions, which they greatly needed. Thence sailing northward they put in at a strait called Brene, and after landing at the southwestern extremity of Strangford Lough, advanced some considerable way into the interior. They had not gone far before they encountered a native chief named Dichu, at the head of a band of men. Mistaking St. Patrick for the leader of one of the many pirate crews which at that time often appeared upon the coast, he was on the point of putting him to death. But struck by the missionary's appearance, and seeing that both he and his companions were unarmed, he hospitably received them into his house. In frequent interviews he now heard the doctrines of the faith, and after a time was baptized, with all his family. According to some authorities he also bestowed upon his instructor the ground whereon his barn was built; and here arose the celebrated church called Sabhall Patraic, "The Barn of Patrick," which still retains the name of Sabhal, or Saul, and is situated about two miles northeast of Downpatrick. Leaving Saul, the missionaries proceeded to northern Dalaradia, and the residence of St. Patrick's old master, Milchu. But nothing would induce the old chief to receive one who had once been his slave, or to forsake the paganism of his forefathers. His journey thus ineffectual, St. Patrick returned to the district where Dichu resided, and made the neighborhood for sometime his headquarters. Thence proceeding southward, he determined to visit the central parts of the island, and especially the famous hill of Tara, where King Laoghaire was about to hold a great religious festival in the presence of all of his tributary chieftains, druids, and bards. In this stronghold of druidism he resolved to celebrate the approaching festival of Easter, and preach the word to the assembled chiefs. It was Easter eve, we are told, when he reached the neighborhood of Tara, and having erected a tent, he made preparations for spending the night with his companions, and kindled a fire for the purpose of preparing food. As the smoke curled upward in the evening air, it was observed by the druids in the king's tents and caused the greatest consternation. To kindle any fire during the solemn assembly of the chiefs, before the king had lighted the sacred flame in the palace of Tara, was a sin of the greatest enormity, and the druids did not scruple to warn the king that if the fire of the stranger was not extinguished that night, unto him, whose fire it was, would belong the sovereignty of Ireland forever. Messengers were accordingly sent to discover the authors of the sacrilege, and to order them to appear before Laoghaire. The missionaries went, and their fearlessness when in the presence of the monarch and his nobles won for them a respectful hearing. On the following day St. Patrick again addressed the chiefs, doubtless in their own language, and proclaimed to them the doctrines of the faith. Laoghaire himself, indeed, did not profess to be a convert, but he gave permission to the man of God to preach the word, on condition that he did not disturb the peace of the kingdom. During the ensuing week, therefore, when the great public games were celebrated at Tailten, the missionary and his companions addressed themselves to the youngest brother of the king, and were so favorably received that he professed himself a believer, submitted to baptism, and is said to have given the site of a church called afterward "The Great Church of Patrick." 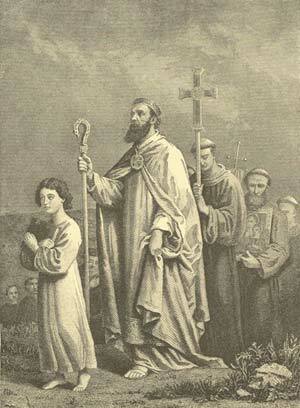 St. Patrick journeying to Tara. The impression thus made upon the chiefs was soon shared by their subjects, and though the pagan party made frequent attempts to put the missionaries to death, from which they narrowly escaped, they were heartily received in Westmeath, Connaught, Mayo, and Ulster, and before long found themselves strong enough to destroy the great idol Crom-cruach, on the plain of Magh Slecht, in the county of Cavan; and, in the district of the clan Amalgaidh, admitted to baptism the seven sons of the king and many of their people. To the worshippers of the powers of nature, and especially the sun and other heavenly bodies, St. Patrick proclaimed that the great luminary which ruled the day had no self-originated existence, but was created by One whom he taught them to call God the Father. "Besides him," said he, "there is no other god, nor ever was, nor will be. He was in the beginning before all things, and from him all things are derived, visible and invisible." He told them next of "his only begotten Son Jesus Christ, who had become man, had conquered death and ascended into heaven, where he sat far above all principalities and powers, and whence he would hereafter come to judge both the quick and the dead, and reward every man according to his deeds." "Those," he declared, "who believed in him, would rise again in the glory of the true Sun, that is, in the glory of Jesus Christ, being by redemption sons of God and joint-heirs of the Christ, of whom, and by whom, and to whom, are all things; for the true Sun, Jesus Christ, will never wane nor set, nor will any perish who do his will, but they shall live forever, even as he liveth forever with God the Father Almighty, and the Holy Spirit, world without end." Such, as it would seem from his "Confession," was the Gospel he proclaimed, and his words, confirmed and illustrated by his own intrepid zeal, ardent love, and sincere and devoted life, made a deep impression on the minds of the Celtic chiefs. With the religious enthusiasm deeply seated in the primitive Celtic character, which many years before won for St. Paul so warm a reception in Galatia, their hearts were touched and they welcomed the missionary, and believed the word which he preached. As time went on, the labors of St. Patrick were lightened by the arrival of the bishops Secundinus, Auxilius, and Isserninus, whom he had sent either to France or Britain to receive consecration. Their coming enabled him to extend the sphere of his operations, and he undertook missionary tours in Meath, Leinster, Ossory, and Munster. These continued for several years, during which he was occupied in preaching the word, baptizing new converts, and erecting churches. Knowing well how much his own acquaintance with the native language had contributed to his success, he labored diligently to establish a native ministry wherever he went. Cautiously selecting from the higher classes those whose piety and intelligence seemed to fit them for the work of the ministry, he established seminaries and monastic schools, where they were trained and educated; and to these schools the young of both sexes flocked with extraordinary eagerness. While he was laboring in the southeastern part of Munster, a petty prince of Cardiganshire, named Coroticus, though apparently professing Christianity, set out from Wales, and descending on the Irish coast with a band of armed followers, murdered several of the people, and carried off a large number with the intention of disposing of them as slaves. This outrage, perpetrated in one of the districts where St. Patrick was baptizing, roused his keenest indignation, and he wrote a letter, which he sent by one of his companions, calling upon Coroticus to restore the captives, many of whom had been baptized. But his request being treated with contempt and scorn, he composed another circular epistle, in which he inveighed in the strongest terms against the cruelty of the marauding tribe and its chief. He contrasted his conduct with that of the Christians of the Continent, who were in the habit of sending large sums of money to ransom captives, and concluded by threatening him and his followers with excommunication, unless he desisted in future from his piratical habits. What was the result of the epistle is not known, but it is to be feared that the attempt to recover the captives was not successful. Slavery and the trade in slaves was almost more difficult to root out than paganism, and the inhuman traffic was in full activity as late as the tenth century between England and Ireland, and the port of Bristol was one of its principal centres. Meanwhile, after a somewhat lengthened sojourn in the district of Lowth and parts of Ulster, St. Patrick reached the district of Macha, containing the royal city of Emania, the residence of the kings of Ulster, the remains of which, under the name of the Navan, still exist about two miles west of Armagh. Here he was cordially received by Daire, a wealthy chief, who made over to him a pleasant piece of ground on an eminence, Druim-sailch, or "Hill of the Willows." The spot pleased St. Patrick, and here he determined to erect a church. The foundations were accordingly laid, and around it rose by degrees the city of Armagh, the ecclesiastical metropolis of Ireland; and here its founder spent the remainder of his life, only leaving it now and then to visit his favorite retreat at Saul, round which clustered so many associations of his earliest labors, and of his first convert Dichu. Here, too, having called to his aid the bishops Secundinus, Isserninus, and Auxilius, who next to himself were best qualified by long experience for the work, he proceeded to hold synods, and to make regulations for the general government of the churches he had founded. Again and again he was solicited to revisit his friends and relatives in Scotland, but nothing could induce him to leave his post. In his "Confession," written when far advanced in years, he touchingly describes how often he had been requested to come among his kinsmen once more, but how a deep sense of the spiritual love between himself and his flock ever retained him in Ireland. It was while he was staying at Saul that the apostle of Ireland was seized with his last illness. He had lived to a good old age, and the sunset of his life was calm and peaceful. Perceiving that his end drew nigh, and desirous, as we are told, that Armagh should be the resting-place of his remains, he set out thither, but was unable to continue the journey. Increasing weakness, and, as it seemed to him the voice of an angel, bade him return to the church of his first convert; and there he closed his eyes in death, probably in the year A.D. 466, leaving behind him the visible memorials of a noble work nobly done. He and his fellow-laborers had made for themselves, by the labors of their own hands, civilized dwellings amid the tangled forest and the dreary morass. At a time when clan-feuds and bloodshed were rife, and princes rose and fell, and all was stormy and changeful, they had covered the islands with monastic schools, where the Scriptures were studied, ancient books collected and read, and native missionaries trained for their own country, and for the remotest parts of the European continent.